While Presbyterians as a whole have become more adept at closing churches than opening them, there are a few of us crazy people who are absolutely passionate about giving birth to new churches. I am convinced that planting new churches is the best way of reaching new people for Christ. After all, if my beloved congregation has been ministering its head off for 200 years on the same street corner without reaching its neighbors, it probably isn’t going to start reaching them next week. However, something brand new in the community just might stand a chance. And I believe it’s a chance worth taking. Anyone who has any experience with starting a new church knows the endless hours spent knocking on doors, writing sermons, creating PowerPoint presentations, practicing music, leading small groups, communicating a vision, drinking coffee with community leaders, starting prayer groups, setting up chairs in the local elementary school, creating a budget when you have no idea where the money will come from next year, serving spaghetti, putting up signs, training leaders, designing web sites . . . well, you know all the things that really should go on this list. As I said, it’s hard work. One new worshiping community leader once said to me in a moment of total frustration, “There’s just so much nothing”—no building, no Sunday school teachers, no job descriptions, no Bibles, no chairs, no elders, no coffee pot, no one to buy the coffee pot or make the coffee, no musical instruments, or bulletins, or computer, or members. 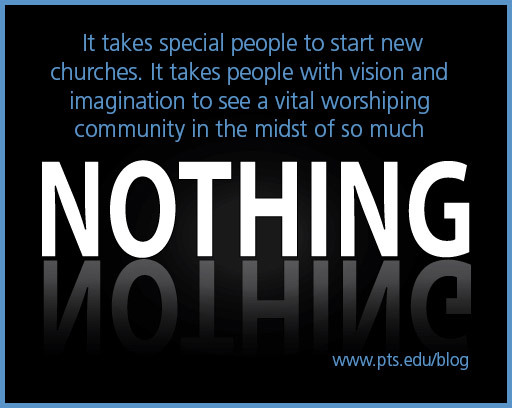 Sure, it’s exciting to start from scratch, build something from the ground up, create a brand new culture, but still – “there’s so much nothing.” It takes special people to start new churches. It takes people with vision and imagination to see a vital worshiping community in the midst of so much nothing. It takes people with perseverance to keep knocking on doors and drinking coffee with the right people when the nothingness threatens to overwhelm. It also takes presbyteries and partner congregations and a denomination who share the commitment to a brand new kind of ministry. Faithful pastors and members of existing churches may look with suspicion on the idea of new churches in their back yards. After all, the suggestion of a new church means to some that what they are doing is unsuccessful or inadequate. It plants the seeds of misgiving that established churches will suffer in attendance and income when a newcomer invades the neighborhood. And don’t forget that planting new churches is an expensive form of ministry. At a time when presbyteries feel the pinch of declining resources, some spendthrift suggests squandering scarce resources on a risky business. Most presbyteries have a story of an expensive new church plant that failed to thrive. No wonder “we tried that once and it didn’t work” is a familiar refrain. Going into an existing church with the news that a new church is on the drawing board doesn’t always bring cheers of enthusiasm. Why, then, do church planting pastors and leaders and presbytery staff people continue to do this hard and faithful work of planting new churches? First, I believe we are faithful to the Gospel when we are absolutely passionate about making new disciples. New churches are evangelistic at their very core. Their purpose is to engage people who are not presently involved in any worshiping community. Planting new churches is one very powerful response to the Great Commission. New churches provide a unique opportunity of taking the unchanging gospel to an ever-changing culture. Unburdened by traditions and history, new churches are able to pare ministry down to its essential components and work on making the Gospel accessible to a new generation of believer that doesn’t know the words to the old hymns. New worshiping communities are always contextual. They are at their best when they align their ministry to the needs and gifts of a particular community. New church development is certainly not for everyone. Many faithful people find meaning and nurture in the traditions and rituals of the established church. But, there are a few courageous entrepreneurs who rise to the challenge of discovering a brand new way of worshiping God, relating to unchurched people, engaging the surrounding culture, and singing a new song. We do this best when we work together—presbyteries, congregations, and new worshiping community leaders. Unfortunately, we succumb too easily to the sins of distrust and blame and self-centeredness. We tend to forget that we are on the same team. We succeed when we love and trust and care for and challenge each other to new levels of faithfulness. There is no more exciting and challenging and important ministry than starting new worshiping communities. The work that happens in new worshiping communities infuses the whole church with new Holy Spirit energy. Both old and new churches are enriched when they follow Christ outside the church doors and into the neighborhoods around them. Vera K. White is the coordinator for 1001 New Worshiping Communities of the Presbyterian Church (USA) and has an office at Pittsburgh Theological Seminary. All the preparation of an M.Div./MSW equips you for ministry in the community. Ministry and particularly prayer in the community are, at times, difficult. Often we spend more of our time in preparation for community prayer worrying about who we will offend, instead of praying to the God who unites us. In all Christian mainline denominations communal prayer is a regular part of our worship. Some communities might offer prayers of repentance and confession, others offer prayers of the people (or supplication), and others say the Lord ’s Prayer each and every week. We are taught in church that praying together, in community, is important. Depending upon denomination, culture, or area of the country, praying together can last three minutes or one hour. Regardless, that joining together, uniting our voices, listening for God together, is critical to the life of the church and to our own personal life in Christ. It allows us to remember that faith is not mine or yours, but a gift of God in Jesus Christ. Faith is not something that I choose, but over and over again God chooses me. I have learned that most about praying in the community by being a parent. When our son was born six years ago, we knew we wanted to pray as a family, but had no idea how. We started by praying before meals and at bedtime. The desire of my husband and I was that our son, even at age 1, would be an active part of praying, not passively wondering what mommy and daddy were doing. So we pray by saying thank you. 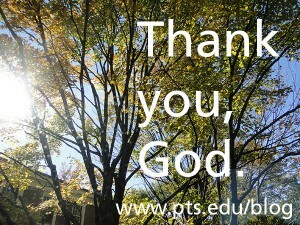 Our prayers are simply thank you God for . . . and we list the people we saw that day, the things we did, what we ate, and at the end of each prayer we say, “thank you for ___” and our son fills in the blank. As soon as he could talk, he started filling in this blank. Some days he is most thankful for trucks, snow, Skylanders, Legos, Grandma or Grandpa, or candy! We never know what he will say. But what we all do know is that we have something to be thankful for. Ministry and prayer in the community reflects this time of prayer in my family. 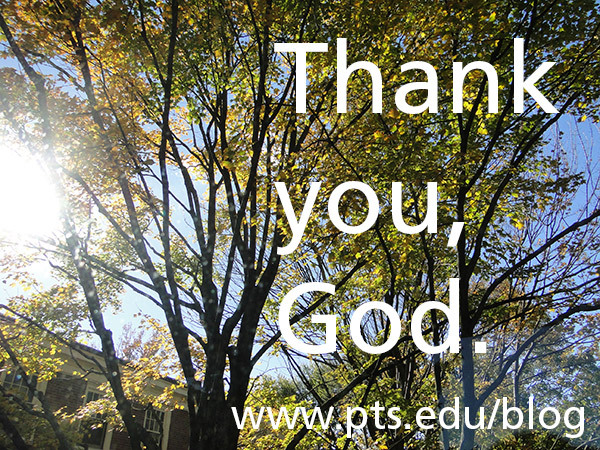 When I go to write prayers for worship or offer a prayer at a gathering I start and end with thanksgiving. The great God of all has given us the opportunity to be in conversation, what more can I say than THANK YOU? So the next time you are wondering what in the world to say during a community prayer, say Thank You. The next time you are frustrated by prayers happening in your church or you lose track of what the preacher is praying about, say Thank You. The next time you are rolling your eyes at the idea of having to pray communally again, just say Thank You. And listen for what God says back.